Hocum Pocum Lane was a former name of what is now Dermody Road in Hither Green; it was known by a number of variants including Hokum Pokum or Hocus Pocus. It was part of an ancient footpath that started opposite St Mary’s church, following roughly what is now Romborough Way, then the footpath by the side of Canada Gardens, following Ryecroft Road before joining what is now Dermody Gardens and Road crossing the Quaggy roughly where the current pedestrian bridge is now and then following what is now Weardale Road to Lee High Road. There was a fork in the right of way around Ryecroft Road where another route headed towards the early settlement of Rumbergh or Romborough which was centred around the junction of Hither Green Lane and George Lane – which was covered a while ago in the blog. Pistols, lantern and jemmies were found hidden in a hedge near Lee High Road (close to the Rose of Lee) presumably around the same time. Hart also asserted that ‘medical gentlemen, too, on their journeys from Greenwich to Lee, when attending their patients, never went without arming themselves with a brace of pistols’ and that Lee in the early to mid-19th century ‘was so rural as to be unsafe to be about after dusk’. Mr Hart though was not always the most reliable narrator…. The area around Hocum Pocum Lane had been one of nurseries in the first half of the 19th century – the main one being the then renowned Lewisham Nursery, run in its later years by Willmott and Chaundy, which finally closed in 1860. Amongst the plants they specialised in was wisteria – although the street name seems to come from a 14th century name for the hillside leading down to the Quaggy (1). a number of genteel houses, which have been constructed with astonishing rapidity on Eastdown Park, and which are daily augmenting, being much sought after by those whose business is in the city, and who seek a residence here. The early ones and the current street pattern can be seen from the 1870 Ordnance Survey map above (source) which was surveyed in 1863. 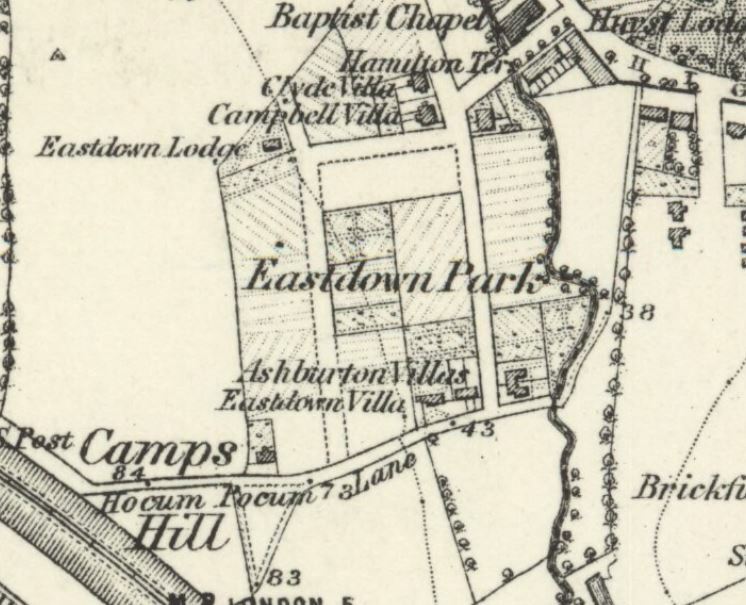 Many of those early houses didn’t survive that long – Clyde Villa and Campbell Villa made way for the Edwardian Telephone Exchange, covered on the blog in July 2015; and Ashburton and Eastdown Villas too were short lived. 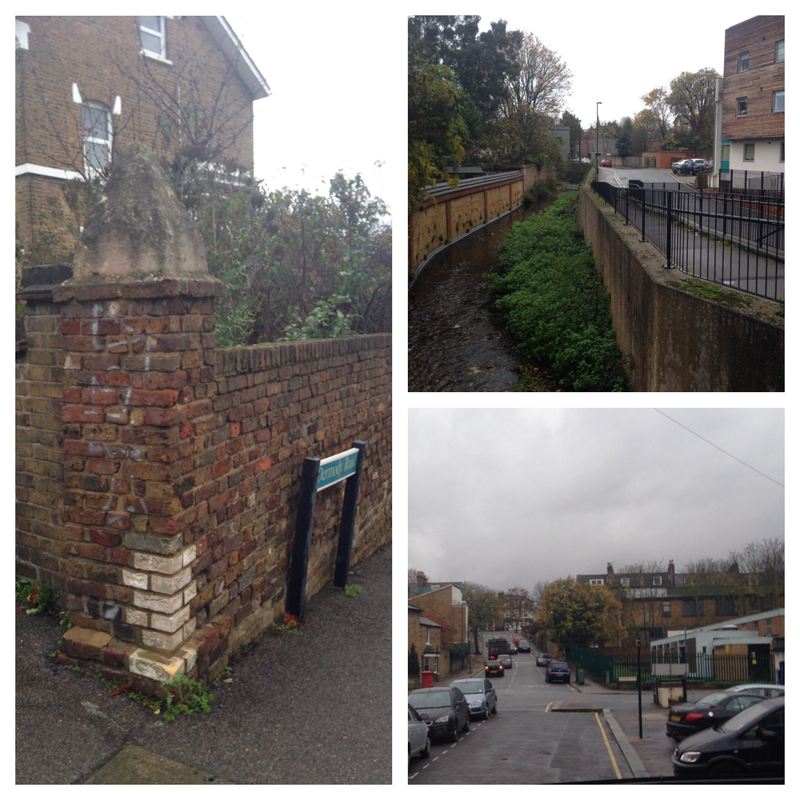 It may be that two of their gateposts survived – one is on the corner of Wisteria Road – although they could be earlier and relate to Lewisham Nursery. Development continued apace and by the time the Ordnance Survey mapmakers returned to survey the area in 1893 the street pattern and most of the housing was mainly as it is now. Presumably it those marketing the homes, particularly on the former Hocum Pocum Lane itself, felt that the well-to-do of the new London suburb would rather that their street was not associated with term relating to something untrue or insincere (or a magical term with the Hocus Pocus variant). 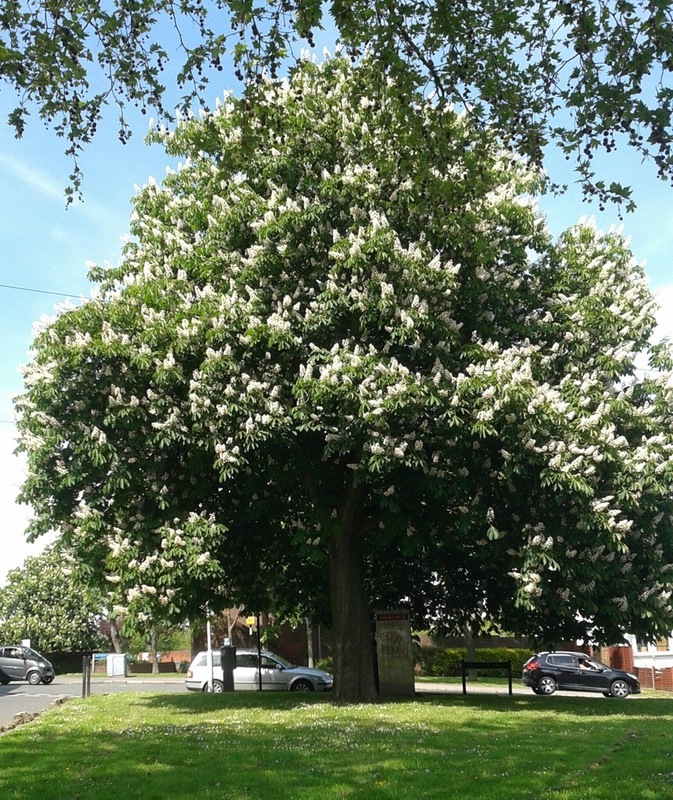 So instead, the road was renamed in 1879 after an alcoholic Irish poet who had died in a Sydenham hovel and buried at St Mary’s Church – Thomas Dermody, whose sad story was covered in the blog 18 months ago. Anyone following the link to the 1893 surveyed OS map will see that what is now Leahurst Road is marked as Ennersdale Road, which then was a dog-leg – the name was changed a year or two later when Leahurst Road was developed to the south. The house of the corner with Dermody Road has a just visible street sign marking its former name. This entry was posted in Lewisham History and tagged Hither Green, Hocum Pocum Lane, Hocus Pocus Lane, Hokum Pokum Lane, Lee, Lewisham Nursery on November 18, 2015 by Paul B.